Thejesh, the programmer and InfoActivist, who exposed Airtel’s spy-code injection in their customer’s browsers and websites has decided to strike back against the Israeli firm which sent him a Cease and Desist Notice for exposing their modus operandi. In a legal reply sent to Flash Networks Ltd., he has demanded an unconditional apology for both inserting an unknown code in his website and for violating his privacy. Thejesh, who claims to be an independent blogger, InfoActivist and programmer found suspicious codes being inserted in his website. When he further investigated, he found them to be originating from Airtel Owned IP Address. Infact, this code generates an iframe, which tries to forcefully install a toolbar in the user’s browser. When he published his findings and uploaded the malicious code on Github, the company which created this code on behalf of Airtel: Flash Networks from Israel, sent a legal notice to Thejesh for illegally uploading their proprietary code on Github. Thejesh has now legally replied to the Cease and Desist Notice, and has initiated a counter attack by demanding unconditional apology. – Thejesh followed the industry protocol of publishing any findings or discoveries which can lead to exposing of unethical, and illegal actions. The code and the modus operandi was published on Github so that other researchers and programmers can dig deep into the issue, and find out the culprits. – The complete flow of Airtel and Flash Networks’ unethical manners of injecting a malicious code has been explained in detail, including the specific IP Addresses from where the code and iframes originates. – The fact that Github is a collaborative platform for researchers and programmers who wish to publish their findings. Infact, every code or document uploaded on Github is assigned a Digital Object Identifier, which makes citation easier. 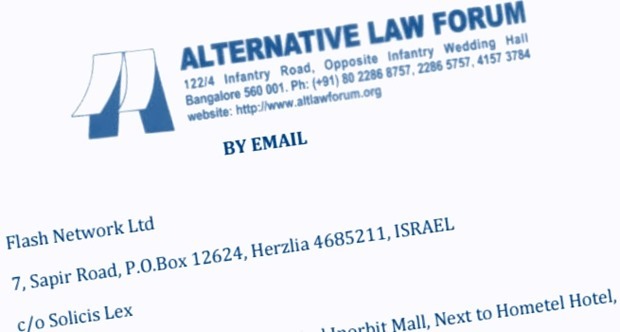 – Considering that the Israeli firm resorted to a Cease and Desist Legal Notice to silence and intimidate Thejesh, he now reserves the right to proceed legal and civil case against them. The case has now taken an interesting turn, as the Israeli firm will certainly find themselves in hot water: if they apologize, then it will prove their guilt, and if they don’t, then Thejesh has left enough room open to proceed legally against their firm and their client Airtel. You can read the complete reply given by Thejesh GN below.